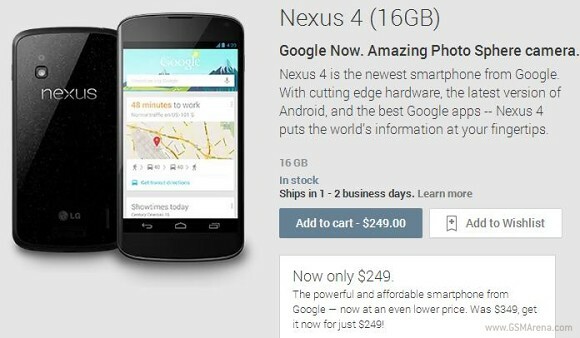 In a truly surprising fashion, Google gave the LG-made Nexus 4 smartphone a massive discount. The device is currently priced in the Google Play Store at a sweet $199 for the 8GB version, and $249 for a handset with 16GB of on-board memory. The abovementioned price tags will get you a brand new, contract-free Nexus 4. This is quite an aggressive move by Google, as most top-shelf smartphones in the United States are price in the $200 range with a contract. Furthermore, the LG Nexus 4 has received at least a 25% discount in a handful of other markets. They include Australia, Canada, Germany, Spain, Korea, and the UK. The Nexus 4 was already quite a bargain at its original $299 starring price. We suspect that the available quantities won't last long, so if you are on the market for a top-end Android smartphone on a budget, now is a good time to act. Does anyone have the link to where I can buy the nexus? Pls let me know. I want to buy it in US. google play is not showing this phone. Can anyone send a link to me from where I can buy it.